A pickup truck is shown Thursday evening shortly after it was pulled out of Rocky Fork Lake. Divers were called in Thursday evening to rescue a pickup truck that was submerged in water at Rocky Fork Lake. 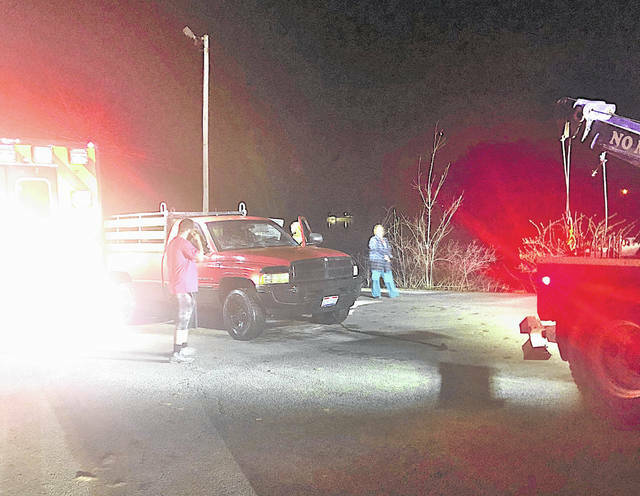 Lt. Brendan Jackman with the Paint Creek Joint EMS/Fire District said the Highland County Sheriff’s Office called the district around 8:30 p.m. after a pickup truck owned by Chester Akers of Hillsboro rolled down the South Beach boat ramp off Blue Ribbon Road into the lake. Jackman said it was his understanding that some kind of mechanical failure with the vehicle caused it to roll backward into the lake. The vehicle was completely submerged in six to eight feet of water, Jackman said. Normally, Jackman said, officers can walk into the water and hook a tow cable to a vehicle in similar circumstances, but the lake water was 51 degrees, so divers were called in. He said they swam a cable out to the vehicle, went under the water and hooked the cable to the vehicle, then a tow truck operator pulled it out. Jackman and Steve Smith were the divers. A vehicle submerged under water is typically ruined, Jackman said. But he said the battery was still working when the truck was pulled out. “You could see the headlights glowing in the water and the windshield wipers were still working when they pulled it out of the water,” Jackman said. Ohio Department of Natural Resource officers and the sheriff’s office assisted at the scene.